Biography: Steward, Dave. 1945- . Born in Nairobi, Kenya. Educated at the University of Stellenbosch, 1962-65. Joined the South African Department of Foreign Affairs in 1966. Ambassador to the United Nations in New York, 1981-82. Policy Adviser on Southwest Africa/Namibia/Angola, 1983-85. Head, South African Communication Service, 1986-92. Director-General, Office of the South African President, 1992-94. Executive Director of the FW de Klerk Foundation, 1999- . Managing Director, Canopus Consultancies, 1997- . SO: This is Dr Sue Onslow interviewing Mr Dave Steward in Cape Town on a very wet Wednesday, 17th April 2013. Dave, thank you very much indeed for agreeing to talk to me. I wonder if you could begin by saying, please… Having been born in Kenya then educated in Canada, did you form a particular view of the Commonwealth as a boy and young man? SO: [Laughter] When was it realised that this wasn’t quite the gentleman they had in mind? DS: Well, I think that after the introductions had been made, the penny dropped. [Laughter] Needless to say, he was very disappointed. SO: Indeed, he would have been! I know that Sonny Ramphal was also disappointed not to have been appointed Secretary General of the UN. DS: Okay, right. I started school in Canada, and Canada at that time was still very, very much a part of the British Commonwealth and the whole ethos that went with it. My Grade Three teacher, Mrs Dougherty, was of the opinion that nobody could ever surpass Queen Victoria in the role that they [the British] played in international and global affairs. There was, in fact, a national holiday on Queen Victoria’s birthday, which was 24th May. DS: That’s right. At the time of the Coronation of Queen Elizabeth, there was a great outburst of royalist fervour in Canada. I had the great honour of being called on to draw and establish the little golden coach and the royal montage around our classroom. So, my sentiments were strongly royalist. Then I actually went from there to school in England and I spent the rest of my prep school days in London. I then went to an English public school – St John’s School, Leatherhead – where I spent three relatively agreeable years. The nature of such schools was naturally conservative: they all thought The Queen was a good idea and also [that] the Commonwealth was a good idea. So, I had very strong affinities with Britain and my education at school was, in essence, British, and I had a great affection for the culture and the history. I came back to South Africa in 1960 when I was 16, and I went to Stellenbosch University, which was a bit of a change. I started at Stellenbosch in 1962 and it was a completely different experience, as you can imagine – in many respects, a very pleasant experience. My father’s objective was to give me some emotion on the other side, the Afrikaans side. He was a diplomat, who had been posted in East Africa, Canada and then London. So, I arrived at Stellenbosch in the early 60s, when it was quite a different place from what it is now, and I really enjoyed it. It was an extraordinarily pleasant, lovely place: lots of academic stimulation and interesting politics. I did a not-very-demanding course centering on Political Philosophy – which is a wonderfully nebulous subject – [as well as] English and French. The whole objective of our Political Philosophy professor – whose name was Johannes Degenaar – was to urge young Afrikaaners to re-examine their values and their orientation in politics. My general response to that was reactionary. But I actually had lunch with him and a friend, one of my classmates, a couple of weeks ago. It was quite an interesting occasion: to see how, after the great gulf of years, things had changed, in that period. SO: That’s quite an image you’re conjuring up! SO: …more than the Afrikaans–speaking? DS: I think it was about 50/50. SO: Was there a cultural tension between the two? DS: Not at all. The interesting thing about my career in the public service was that I was extremely English-speaking – because of my background, I didn’t really speak much Afrikaans at that time – and it was never a problem at any time in my career. Nobody ever asked me what my political views were, or what party I voted for. It just didn’t even come onto the radar. SO: So, you didn’t pick up on any official criticism of South African…? SO: Hmm. He clearly had not digested what was going on there. SO: As you say, quite parochial and ill-informed. DS: Indeed. But anyway, it was a great experience. I came back to South Africa and I spent quite a lot of time here on the North American desk and doing parliamentary duty – so, going up and down from Cape Town to Pretoria and doing the parliamentary sessions and really enjoying it, but then also learning how the system worked and what the constraints were. Particularly, at that time, the developing struggle was between Department of Foreign Affairs and the Department of Information, which was under the leadership of Eschel Rhoodie. [He was] an interesting guy, who was quite clever. We played cricket against Information. He [Rhoodie] was a great sportsman, and he would bat a metre outside of his crease. He’d hit the bowling around, but one of the realities of cricket – and indeed of politics – is that if you bat a metre outside of your crease, you are going to be stumped. SO: You are. You’ve stepped too far out of your safety zone. DS: You’ve stepped too far out of your safety zone. Now, he made no secret of his political ambitions and of the very high opinion he had of his own performance and qualities. He let it be known, more or less, that Connie Mulder was going to become the next Prime Minister, and that when Connie Mulder became Prime Minister, he was going to become Minister of Foreign Affairs. This was really very brash and upfront. And he also, as the Secretary for Information, fell into the enormous pit of communicating on behalf of other government departments, because that is the great temptation. SO: To try to be the mouthpiece? SO: Because you make them totally redundant. DS: That’s right! [Laughter] Anyway, I’ll come back to that later. And so he was alienating people, and going up and down in the lifts of the Hendrik Verwoerd Building…I saw it was not only the Department of Foreign Affairs that was unhappy with Eschel Rhoodie, but it was a whole lot of other government departments. That brings me on to another reality of politics, and that is that you don’t get fired for screwing up; you get fired for screwing up when you don’t have anybody to cover your back. So, the reality is that, when the Information Scandal broke, had Eschel Rhoodie and Connie Mulder not made themselves so unpopular with the rest of the establishment, the establishment would have closed ranks behind them. SO: As it was, they all folded their arms and smiled. DS: They all folded their arms and smiled. They left Prime Minister John Vorster dangling in the wind. So, those are rather important things to learn as a young officer: to realise that this is what the world is actually about. It’s about making alliances and not making enemies, and a lot of it is about positional play. SO: Was this particularly how the game of politics was played here, in South Africa, or do you think that’s a truism? DS: I think that’s absolutely universal. It’s universal. And the other thing, too, is how very unwise it is to make no secret of your ambitions. SO: I’d agree there. Naked ambition is never attractive. DS: For me, it was very much like snakes and ladders. Roll the die and you step on a ladder or you step on a snake. This was a minor snake. SO: At least you hadn’t gone back down to square one. SO: That’s rather a delicious irony. [Laughter] So, when did you go to Canada? DS: I went there in 1976. SO: That was an interesting year to go and defend the South African interest. DS: It was. In fact, it was just after the Soweto riots, so the situation was becoming very tense. I went across there, and Ottawa is…I don’t know, have you been to Ottawa? SO: I was there two weeks ago. SO: In terms of your professional responsibilities there, was it a tough diplomatic post? DS: It was the toughest diplomatic post, because nothing was happening. There was no material to work with. I was the second-in-command of the Embassy, and so I ran the Embassy, but there was very little possibility of really achieving anything at that time in Canada. I took the South Africa desk officer out to lunch at one of the places in Hull, across the river, and wanted to get to know him. I didn’t want to make any challenging statements. His name was Geoff Weir, [and] he was absolutely bristling with indignation. And I just said to him, “Well, you know, is there anything that we can do that will satisfy you?” He said, “No, not really.” So, that was a bit discouraging. SO: Well, you had a tough brief as a diplomat then, because after all, South Africa had moved troops into Angola and was being castigated at the UN and under huge pressure to withdraw. DS: That’s right, and with the support of and at the request of the Americans. Not quite as black and white as one might think. SO: Were you aware of that? This question of whether you had American encouragement and support? DS: Yes, I was aware of that at that time. DS: Yeah, maybe I picked that up later, but I think that the orientation of the OAU was fairly well known at that time. The commander was talking about “the tiger with her ravening cubs” coming into Africa. So, yes, it was a very difficult brief but what I’m pointing out is there was nothing really to do: the doors of the Department of External Affairs were closed, virtually. There was a little work that you could do on the trade side, and you could address groups of Empire loyalists and this and that. But it was all extremely peripheral and very frustrating, and the image that I had of it was of the elm tree outside my office window dying of Dutch elm disease, which seemed to sum up the situation. [Laughter]. I then tried to urge our Ambassador to take a more activist role. He was a quintessential gentleman, who had been in the army during the Second World War – moustache, intelligent man, sensitive man… I said, “Look, you’ve got to go and try and put the case on TV. You can’t expect Canadians to understand what’s going on if we don’t put our case.” And he did, and he just didn’t have the debating skills to make his point. He was carved up – little pieces of Ambassador all over the studio walls. Then he left. He was recalled to South Africa at the end of his tour, and I went to the farewell lunch for him at the Department of External Affairs and it was a little bit strained, as you can imagine. And he said, “I must apologise. I believe that I failed to do my duty as an Ambassador here because the relationship between Canada and South Africa has deteriorated to such an extent during my posting here.” And they said, “Oh, no, it’s not you as an individual.” But it was an indication of the extreme difficulty of doing anything at all as a diplomat under those circumstances. Then, fortunately, I stepped on a ladder – or a ladder came and stepped on me, whichever way it was – and after less than two years in Ottawa I was transferred to New York. New York was a completely different kettle of fish, because there one was dealing with real issues: negotiations on Namibia, where South Africa – although the villain of the piece – was the role player, so you had the raw materials of diplomacy that you could work with. I arrived just before the adoption of Resolution 435. I spent a lot of the subsequent three or four or five years working on the Namibian negotiations, which were very interesting, and which indicated, again, the bad faith of the West and of the five Contact Group countries. The reality is that, when Resolution 435 was adopted, Resolution 432 was adopted, too, which simply gave Walvis Bay to Namibia. This was pulled at a very late stage against South Africa, without really giving us proper warning – by the West, by the five Western countries on the UN Security Council – because that was the price that SWAPO had demanded for their even considering to go along with 435. It was absolutely illegal. There was not a respectable international jurist in the world who would have tried to argue that Walvis Bay was not properly a part of South Africa. It had been even before the advent of the Germans in the territory. I can assure you it is. DS: Oh, it’s a long way. It’s half way up the coastline. But that is neither here nor there. It was part of South Africa in terms of international law – even the UN’s own international lawyers admitted that – but it was simply given to SWAPO. It was then the first of a number of deep disillusionments with the West. The reality is that whenever SWAPO objected to anything, the West would come around to SWAPO’s way of thinking, and they would re-double their efforts on South Africa to make the necessary concessions. SO: In what way was SWAPO encouraged to elicit support particularly from within the Western contact group? What was the balance of opinion within that group? Was the Carter administration particularly sympathetic towards a particular African Liberation movement? DS: Well, it’s not just SWAPO. They were confronted by the Afro-Asian block at the United Nations – and, of course, the Afro-Asian block was being egged on by the Russians. So, it was enormous pressure that could be brought to bear on the West, and there were numerous indications of this. So, for example after we’d agreed to implementation, we went ahead with the invitation to the UN to send a military group to South West Africa to do the detailed planning for the implementation of the independence process. The leader of the UN group was a General Hannes Philipp from Austria, and they reached an agreement with the SADF on how troops should be confined to base and what the timing should be, etc., etc. But he went back to New York and the SWAPO said, “We’re not going to accept it.” So, Philip was kicked out. [Laughter] And they came along with an implementation plan which was egregious and completely one-sided. South African forces would be confined to their barracks in northern South West Africa and monitored by UNTAG, but SWAPO forces just across the border in Southern Angola wouldn’t be monitored, but would have immediate access to the most populated part of the territory, if they wished so to do. So, there were numerous elements where what had been a relatively balanced agreement, drawn up with General Philipp, was twisted immediately into a very unbalanced document. This, I think, brought us to about the spring of 1979, and PW Botha was incensed over this. He regarded this as a breach of faith and he wanted to pull out entirely. In fact, he wanted to pull out entirely after the debacle with General Philipp, and then he announced that he was going ahead with the internal elections at the end of 1978. The West sent a Contact Group to see him with Cyrus Vance – I think it was Cyrus Vance – and persuaded him not to go for a UDI on the basis of the successful outcome of the election, as far as the internal parties were concerned. He then agreed that he would leave it up to the parties themselves to decide whether they wished to go back to the UN plan – which they did. But then with the next Implementation Plan, which was published at the end of February, there were further shocks, again, showing the degree to which the Secretary General and the West had capitulated to the demands of SWAPO and the African block at the UN. I think at the beginning of March PW Botha was keen to break on the whole issue, because he was an irascible man. SO: Indeed. What was the diplomacy of South Africa’s attempts to resolve this issue? Did you form particular alliances behind the scenes at the United Nations? Or did you find yourselves increasingly isolated? As you say, you were under pressure from an Afro-Asian block and from a particularly sympathetic administration in Washington which was predisposed to supporting racial justice in southern Africa. DS: We found ourselves very much on the defensive throughout the Carter Presidency – the remaining part of the Carter Presidency. So, we were very disillusioned with the behaviour of the West within the Contact Group countries in 1978 and 1979. This led to a whole process of proximity talks and efforts to…Where I think the West did try to make constructive contribution to ensure that the demilitarised zone that we secured, etc., with all sorts of stuff that could detect movement through the zone. But it didn’t really amount to very much. Then there were more proximity talks in Geneva at the beginning of 1980, I think, which ended in an inconsequential manner, but then of course Reagan came into office. SO: Did the outcome of the Rhodesia/Zimbabwe settlement at Lancaster House and the subsequent elections influence you dramatically on the South West Africa question? DS: Not really, no. I think this was firmly on another track at the time. So, in any event, the Reagan administration came into office the beginning of 1981 – yes, because the election was in 1980. That changed the situation. The Americans suddenly had an appreciation for our geostrategic concerns on the presence of the Cubans and what have you in Southern Angola, and they agreed to ‘linkage’ – that 435 wouldn’t be implemented until the Cubans were withdrawn from Angola. So, my period at the United Nations ended in December 1982. In 1981, to my enormous surprise, I was made Ambassador there. I was only 37, and I think the reason is that nobody else really wanted the job. DS: I was crazy enough to accept the job. SO: Surely it had a lot to do with the knowledge that you had gathered since you went to New York from Canada. SO: [Reading from book] ‘Organs and sub-organs of the United Nations system involved in activities affecting South Africa’. 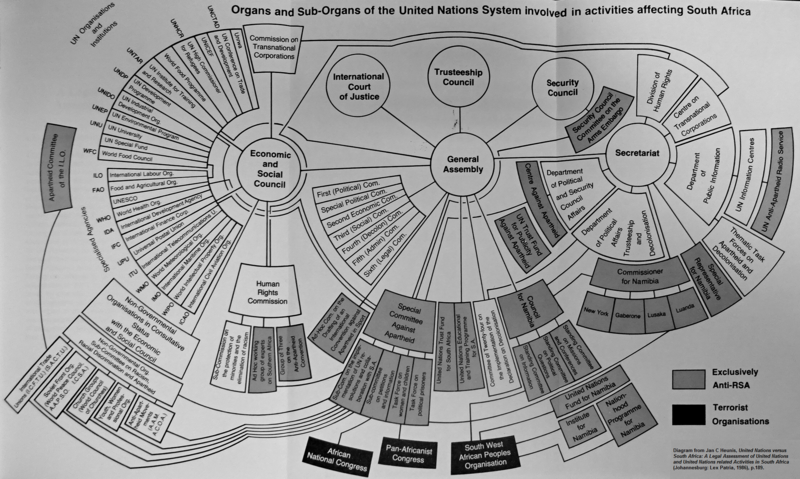 This diagram is in United Nations versus South Africa by Jan C Heunis [Johannesburg: Lex Patria, 1986]. Did you contribute to this diagram? SO: You made this diagram? It’s on page 189. DS: I did a 300-page analysis of this campaign against South Africa, and it was really clear to me that the Russians were absolutely, intimately involved in the whole process, at every stage. SO: So, be it the Economic and Social Council, the General Assembly, the International Court of Justice, the Trusteeship Council, the Security Council or the Secretariat at the UN – it permeated every level? DS: Virtually every level. Virtually every speech in the General Assembly – the general debate – also included South Africa. SO: So, you attributed this entirely to the influence and the direction of diplomacy from Moscow. DS: Not entirely to, but it was certainly enhanced by the global Soviet capability – the Rainbow Coalition, peace councils and allied organisations, anti-apartheid movements and what have you. It was an enormously complex thing, and each one of these bodies had council meetings and special days and weeks against this aspect of apartheid or that aspect of apartheid, whatever it may have been. SO: Dave, can I ask you…Did you identity any particular Commonwealth association or organisation within this multiplicity of associations, groupings, [and] committees? DS: No, this was purely within the United Nations family, but there would have been very similar sentiments within the Commonwealth structures, too. SO: I’m just wondering whether there was any overlay of Commonwealth identity that you appreciated as a South African diplomat. DS: No, not really. For me, this was… Well, I suppose, it was paranoia. We thought of inviting the American Psychological Association to set up an observer post in our mission, because it was one of the few situations where paranoia might be a normal reaction to your environment! SO: How far do you think this was a South African interpretation through Cold War lenses? DS: I don’t think so, no. The Cold War was real. It wasn’t a make-believe thing at all. We know that because our forces were involved in Southern Angola as late as September I987. In big, big battles, against the Russian- and Cuban-led forces. So, we had no… and I think subsequently, when the archives were opened, yes, Virginia, there was an intention to exploit proxy wars in colonial territories – Africa and elsewhere – and there was a National Liberation model, as well. I think this probably, obviously, added fuel to the fire of P W Botha’s views on the ‘total onslaught’ [i.e. the belief that the South African state faced threats on every level of society]. SO: Yes. So, you were at the UN until 1982 and then you were called back to Cape Town, or to Pretoria? DS: Yes, I was. I returned to Cape Town and I was put in charge of what they call the ‘Planning Division’ but in effect it was responsibility for Namibia, Southern Angola, [and] working directly with the Minister, which I liked a lot. The reality is that ambassadors don’t actually have much ability to change events; they are right at the end of the tentacle of the beast. They might send a stimulus up the tentacle and it might or might not impact on the brain, but it’s very much a peripheral role. Many ambassadors completely overestimate their importance: because everybody else thinks they’re important, they think they’re important. And they send off all sorts of stuff to their headquarters saying which way the country should actually go. Most of the time headquarters are not interested, but it is important to keep the headquarters briefed on what’s happening. SO: Dave, this is very much the era – as far as historians are concerned – of the State Security Council and the ‘Securocrats’. Is that a misrepresentation of the dynamics of decision–making, in fact, at the heart of South African foreign policy and diplomacy at this time? DS: No, they were quite good at the dark arts! They were not so good at the subtle arts. I managed to develop quite a good relationship with them. So, I spent a lot of time with General Geldenhuys – playing bridge with him on the way to talks with the Angolans, on the way to the operational area. I was the contact guy from Foreign Affairs with Jonas Savimbi, who was a very impressive man, and who commanded incredible loyalty from the South African Defence Force. SO: That I knew, yes. DS: They had a very high opinion of him. He was very charismatic. SO: Yes. Very well educated, and a consummate linguist. SO: At this particular point, did you think that Angola could be carved up? That UNITA could dominate a separate entity of Angola, in Ovamboland or…? DS: Not really, no. No. SO: Okay. I just wondered if this was ever part of the scenario. SO: The Commonwealth is nowhere in the scenario you are describing here. You‘re talking about hard–headed politics, hard fought battles on the ground, and that the Soviet-Cuban threat in Southern Angola was very real and ever present, and was a key factor in how any solution of the South West Africa problem was to be resolved. DS: Yes. But now, getting back to the Commonwealth, [and to] the Eminent Persons Group in 1986. I think that you have to judge that against the background of what I’ve been mentioning. The deep distrust that PW Botha developed for the international community in general as a result of his experiences during the Namibian negotiations… He wasn’t a guy who wanted to be pushed about. Then, if one considers the Commonwealth itself, the feelings of the government were particularly negative towards the Commonwealth. They dated back to the circumstances under which South Africa withdrew from the Commonwealth in 1961, where the Canadian Prime Minister John Diefenbaker played a particularly important role. I think [that], for many South Africans – especially those of English decent or the old United Party supporters – this felt like a great betrayal. I think they realised that Botha was doing what he could to stay on as a member, and leaving the Commonwealth was a bit of a betrayal and it was seen to be the work of newly emergent independent African members of the Commonwealth and, of course, India. But then also, particularly, Canada, and then later Australia. SO: So, PW Botha and the National Party held a very negative view of the Commonwealth. DS: That’s right, and there was a feeling that the old Commonwealth had been… South Africa had been part of that, had fought in the war with the British and the Canadians and the Australians, and so there was a very strong sense of rejection that white South Africans felt. SO: Particularly English-speaking South Africans? DS: Particularly English-speaking South Africans, and Afrikaners who were members of the United Party. There was a certain degree of animosity that developed, particularly toward the newly-independent countries but especially toward Canadians – because of the role that they’d played – and later to the Australians, because of the role they played subsequently with Bob Hawke and Malcolm Fraser, in particular. So, I think having Malcolm Fraser on the Eminent Persons Group was not a good idea. He was loathed. There was no problem with General Obasanjo, no problem at all. But the South African side loathed Malcolm Fraser. SO: What was the opinion towards Anthony Barber? Was he seen as a representative of Britain, as he had been Mrs Thatcher’s suggestion and was a former Chancellor? DS: There was much greater sympathy, a much greater tendency, to listen to any representative of Britain because of Margaret Thatcher. There was a strong sense that she was prepared, at least, to take into consideration the reasonable concerns of all sides. There was a degree, again, of paranoia – maybe not paranoia, because it was well-based – among white South Africans at the time. One must understand that, from the end of the 1970s, there were huge changes in the country. Up until ‘78, when Vorster was Prime Minister and then for a short period as President, there was still commitment to the idea of separate development – this chimera, this illusion, that Dr Verwoerd had foisted on the country which gave whites the illusion that they had a solution to the problem. So, everybody, faithfully – even after Verwoerd was dead – kept on implementing this thing. And Vorster would say, “This is a problem to be solved by the next generation.” By 1978, when Vorster fell from power, it was clear it wasn’t working: it wasn’t going to work. We needed a solution, and so PW Botha came along and he was a reformist. He said, “Fine. We must adapt or die. We’ve got a find a way to dismount this tiger we find ourselves on. We don’t want to be ruling black people, but how the hell do we get off without being eaten? The rest of the world is shouting at us, ‘Get off the tiger!’ with not the slightest concern about what might happen to us in the process.” That was very much the sense with the Commonwealth, with the exception perhaps of Britain. The other countries represented really weren’t concerned about the interests of white South Africans, and white South Africans naturally have a slightly different perspective. They had three main concerns. The first was the fear that, if we accepted a ‘one-man, one-vote’ outcome at that stage, then it would be ‘one-man, one-vote-once’, as had happened in so many other African countries – that we would decline into corruption, dictatorship, ethnic conflict etc., etc. That was a real fear, particularly in the wake of refugees coming down from Angola and the Congo area and so forth. Then the second concern was that Afrikaners actually believed that they were a nation. The idea of national self-determination had been the central theme of their history, ever since they’d left the Cape, and they had twice fought Britain trying to defend that self-determination. And, you know, the Anglo-Boer War was the biggest war that Britain fought between the Napoleonic Wars and the First World War. It was bigger than Crimean War. It was actually bigger than the American Revolution: there were over 400,000 Imperial troops deployed in South Africa. But the question for Afrikaners – in the whole of the 20th Century, up until 1960 – was this desire of Afrikaners to re-establish their republic. So, now the world was asking them to give this up. SO: Did English–speaking South Africans that you were involved with, in your community, have any similar sense of identity of nationhood with the Afrikaners? DS: It was emerging, but not to the same extent. There was the beginning of a common approach later on. SO: But did the Afrikaners community, that you recall, feel that British speaking South Africans could ‘always go home’? DS: I don’t think at that stage, no, and I think that most English-speaking South Africans were orientating toward the kind of response that Smith, an English-speaking person, had in Rhodesia. So, there was fairly solid support to resist the demands being made by the rest of the world, although most English-speaking South Africans would have been happy to have some kind of qualified franchise and move in a direction… They weren’t concerned about Afrikaner nationalism. So, they were, you know… The Progressives had this idea of qualified franchise, of course, which even by then would have been unacceptable to the majority of black South Africans. So, that was the second concern – that this couldn’t survive in a one-man, one-vote situation. And Afrikaners felt just as strongly about this as Israelis feel about their right to national self-determination, and I think that’s why PW Botha just couldn’t take this step to give up sovereignty. DS: And it’s still, by the way, the intention of the South African Communist Party. The South African Communist Party and COSATU still have this idea, I think, [of] an ‘entry-ist’ approach of moving South Africa beyond the ‘National Democratic Revolution’ to the Socialist Revolution. So, those were the three concerns – and they’re reasonable concerns. One is confronting existential problems, and that is why it is also very important – within the scope of the discussion of sanctions – that people are not going to respond to sanctions if they think that their continued existence is at stake. They may be right or they may be wrong, but if that is what they truly believe, they’re not going to change their policies just so that they can play cricket against New Zealand. It’s not going to happen. And that is one of the reasons why sanctions was such a problematic approach in many respects to dealing with the South African situation. Something that Margaret Thatcher understood very well. Margaret Thatcher understood, also, what the factors were that were actually promoting change in South Africa at this time. A lot of people say, “Well, what change?” But in fact, the 80s were a period of quite dramatic changes in South Africa, starting with the labour reforms of the Wiehahn Commission at the end of the 70s, which extended real trade union rights to black South Africans for the first time. The tri-cameral Parliament was PW Botha’s effort to get one of the legs off the tiger and to bring the coloureds and the Asians into a consociational system. And then, of course, the huge debate was, “What about the rights of black South Africans?” And it was a conundrum. In the meantime, by 1986, I think about a hundred apartheid laws had already been repealed. And what incensed Botha further was the complete lack of recognition by the international community of these changes which had been implemented. It might not have meant very much for the ANC or others, but they meant a lot for Botha’s power base, and it led directly to the split of his party in 1982. But there was no appreciation of these dynamics by anybody other than Margaret Thatcher and later Ronald Reagan. SO: Did you feel that Geoffrey Howe, as Margaret Thatcher’s Foreign Secretary, was appreciative of these dynamics within South Africa? You’re very much personalising the intellectual appreciations of Thatcher recognising the challenges and the geo-political strains on South Africa, and how it was necessary to try to support South Africa going through these changes. Did you feel that other British politicians were equally as aware? DS: No, Geoffrey Howe didn’t want anything to do with it. He was deeply opposed to the whole idea. DS: And he thought it was a death trap: “Don’t get involved there. You will get carved up, horribly.” And, of course, he was right as far as the Eminent Persons Group was concerned, as things turned out. So, you have PW Botha, who was very unhappy about what he regarded as the mala fide of the West in the negotiations on Namibia…He was also extremely frustrated by the fact that these reforms that had cost him a lot, and that had directly led to the unrest in the country from 1984 onward and the split of his party, were simply dismissed – not recognised at all. And it led him to conclude that nothing but absolute surrender would ultimately satisfy the international critics. No, the West would no doubt make a limp effort to hold the line somewhere along the road because they didn’t want anything to collapse, but at the end of the day, the sense was that the West would shake its head sadly and say, “Well, they had it coming to them anyway.” That was the sentiment, I think, that motivated P W Botha. The reforms that he introduced were the direct, I think…one of the main causes of the unrest. PW hadn’t read de Tocqueville and didn’t know that revolutions take place in situations not of repression, but of rising expectations. So, all of this poisoned the atmosphere incredibly in the run up to the EPG initiative. It was Margaret Thatcher’s initiative, and I think that’s why PW dropped his initial absolute opposition to it. I think she pointed out that it would be better than the alternative, so give it a try. And he did, and again that is an indication of the influence that she had. But also I think that, had Margaret Thatcher not been able to hold the line on more draconian sanctions at that time, the consequences might have been very negative, because PW Botha was just as easily capable of shutting down: dropping the shutters and moving into a very grim survivalist regime based on military strength, with a much greater potential – military potential – than North Korea, by the way. DS: We had six and half, but it wasn’t the nuclear weapons that worried the Americans. It was the fact that we were really advancing very quickly with inter-continental missile capability. The Americans played an extremely important role: again, because they were prepared to take into consideration the reasonable concerns of South Africa. So, Chet Crocker played an incredibly important role in managing the whole Namibian process over a number of years. It wasn’t going to be quick, but if anybody should have a statue to them in Windhoek it’s Chet Crocker, because he really did play a masterful role in Southern Africa. He understood the dynamics and he understood the personalities. He knew how to adjust and to take into consideration real concerns, and [he] really applied considerable pressure, on the other hand. SO: By the time the Namibia question was moving towards a conclusion and with the ending of the Angolan war – the parallel withdrawal of Cuban troops and the recognition of Namibia moving to independence with the Accords signed in New York in December 1988 – do you think that those regional scenarios were of critical importance in creating a more propitious climate for accelerating change in South Africa itself? DS: Absolutely. Again, Margaret Thatcher also understood something which none of her contemporaries did: the really important impact of socio-economic change that was happening in South Africa at the time. The reality is that it wasn’t a static situation. People think about apartheid as a monolithic black thing or big white thing [Laughter] that started in 1948 and stopped in 1994. But, of course, it wasn’t like that: it was subject to the same forces and influences as any other political situation. One of the main ones was the dramatic changes that started to happen on the socio-economic front from 1970 onwards. We had reasonably rapid economic growth during the 50s – about 4.5% – but rapid economic growth in the 60s and in the first half of the 70s brought more and more black South Africans into the economy at higher and higher levels. For example, in 1970, the black share of personal disposable income was 22% and the white share was 67%, and coloureds and Asians were the remainder. By 1994, the white share of personal disposable income had dropped to below 50% and the black share was around 38%, with coloureds and Asians and the rest. Now, this might sound rather statistical, but it translated to quite a rapidly closing gap between relative incomes. Not that it’s significant on a per capita basis, but it meant that large swathes of the consumer market were now controlled by black South Africans. So, it also meant that cities were becoming more integrated. The Verwoerdian idea of “unscrambling the omelette” was doomed to failure more quickly than it otherwise might have been. It meant also that whites began to realise that they could not manage the rapidly growing economy on the base of four-and-a-half million whites: more and more black people – just out of necessity – had to become employed in the economy. Hence the Wiehahn Commission report and the idea that, first of all, you had to have a proper relationship between management and labour. But then, also during the 80s, more and more companies – under the influence of the Sullivan codes and the European employment codes – started bringing black South Africans into white collar jobs at higher and higher levels. So, you would have a black bank teller working beside a white bank teller, with the same qualifications, doing the same job. No way they’re going to go to separate restaurants; no way they’re going to go to separate places of entertainment, or ultimately to separate suburbs, and the reality is that under the pressure of the socio-economic forces, apartheid, such as it was, was crumbling. Across a broad front, hundreds of thousands of black South Africans had moved into so-called white areas. Without being opposed. This was a really, really significant process. Government often came along, and what PW Botha called ‘reform’ was legislative recognition of what was already happening on the ground. SO: …[Laughter] To what extent are these arguments indeed your own arguments, or had you reached these conclusions with FW de Klerk? DS: We have a symbiotic relationship. [Laughter] The other thing, too, is the changes in education. Again, if you listen to people, anything that was remembered from before 1994 was Dr Verwoerd’s statement – taken out of context –in 1954 that, “Blacks cannot be trained above a certain level because they will be more or less hewers of wood and drawers of water.” In fact, the situation began to change quite dramatically again at the end of the 70s. In 1980, just a little fewer than 30,000 black South Africans wrote the matric exam, and of those 15,000 passed. In the same year about 49,000 whites wrote the matric exam; probably about 95% passed. By 1994, 410,000 blacks wrote matric and 201,000 passed. That was now three times as many as white matriculants. So, by 1994, there were more non-whites registered in South African universities than whites. SO: So, you’re describing very powerful socio-economic forces at play here: shaping and reframing South African society. People often argue that disinvestment was one of the factors that prompted the end of apartheid, because the economy was starting to stutter and falter and yet it needed to maintain its dynamism if there was to be a degree of peaceful change. The second factor helping to explain the end of apartheid is held to be the role of sport sanctions. DS: Not at all. It would be foolish to say that sanctions had no effect: obviously, they were extremely unpleasant and they caused sometimes serious distortions in the economy. They led us to spend twelve billion Rand investing in Mossgas, which was not really a fruitful investment. And they cost about 1.5% per annum in economic growth. But at no time did they seriously affect daily life in South Africa. On the contrary, they had a lot of effects that were the opposite of intentions. It was, in effect, a classic example of the law of unexpected consequences: when you interfere with economic processes for ideological purposes, the result of your action is nearly always the opposite of your intention. Take, for example, the arms embargo. Because of the threat of the arms embargo from the beginning of the 60s, South Africa developed maybe the fifth or sixth largest armaments industry in the world. And not only did we develop the industry for ourselves: it was one of our biggest exports. Because of the oil sanctions, we bought up an enormous amount of oil at the beginning of the 60s at about $1.50 a barrel and put it in gold mines. When the price went up to whatever it was – $80 – at the end of the 70s, the government sold it and made a huge profit. It also spurred the government to establish Sasol, which was producing maybe 40-45% of the country’s petroleum requirements. We could always get oil; it wasn’t a problem. Although you had to pay a premium again, so… But that was the difficulty. Then, as for disinvestment, again the reality was so far removed from the theory or the perception that it’s almost unbelievable. You take, for example, the investment of General Motors in South Africa. For all of the good people in the United States who thought they were punishing the horrible apartheid government by disinvesting from South Africa… They had this idea a whole lot of money would be pulled out of South Africa, the nasty whites would be punished and the good blacks would be rewarded, and everybody would be able to tell one another what good people they were, etc., etc. What were the realities? The only funds that ever came from Detroit to Port Elizabeth were £25,000 in 1926. All of the rest of the investment was locally-generated loans and locally-generated profits. It was worth about 600 million Rand, I think, by the time of disinvestment. Now, because of the enormous pressure on General Motors, they did disinvest, but what do you do? They had to sell it to somebody, and the only possible buyers were the white South African management. So, they sold it to the white South African management. But there was only one problem, and that is that they didn’t have enough money. So, for the first time since 1926, money went from Detroit to Port Elizabeth – I think about 130 million Rand or so – to enable white South Africans to buy out an American interest at about a third or a quarter of its price! The company continued to make exactly the same Opal vehicles without losing a beat, except it was no longer subject to the Sullivan principles, so they could do all of the things they wanted to do, to rationalise, that they couldn’t do before. They fired a lot of black and coloured employees and the company started to make a bigger profit. SO: Because its overheads were reduced, yes. SO: So, he never made the killing that he hoped for. SO: Sports Sanctions…You said they made no impact whatsoever? DS: No, obviously they made people feel very upset and unhappy and isolated. The reality is that you’re not going to adopt policies that you think will be suicidal because you’re playing cricket against Australia. Yeah? It’s just not going to happen. SO: I’m just wondering if you felt that, for other South Africans not involved in policy–making, that sport sanctions might have had a greater influence. After all, this is a sports-mad nation. SO: So, you’re arguing that rather than being an isolated redoubt somewhere at the bottom corner of Africa, in fact, the Afrikaner constituency was better educated, more urbanised, more sophisticated…? DS: I absolutely do, because it introduced ordinary white South Africans to models of social behaviour involving blacks that they just weren’t aware of. SO: I’ve got two questions to draw to a conclusion. What’s your view of the role of the international community and international players in assisting transition? Allister Sparks has said it was very much a South African success – it wasn’t the UN, there wasn’t a Vance-Owen Plan, it wasn’t a Lancaster House. But would you identify key players, key international forces, helping South Africa’s transition? DS: Yes, I think so. I agree basically with Allister that the strength of the South Africa process was precisely that it was home grown. And it was actually quite a sophisticated process, too. Some of the Arab countries going through transitions would have done well to have looked a little bit closer at the mechanisms of the negotiating forum at CODESA. It was a sophisticated process, and it involved and was driven overwhelmingly by South Africans. But that doesn’t mean that foreign interests didn’t and couldn’t play a positive – and sometimes very positive – role in helping to nudge things in the right direction, particularly when they got off the track. As, for example, they did in June 1992, in the ‘winter of discontent’. I think that Western influence there – in front of and behind the scenes – and all of the parties urging them to return, particularly the ANC, to negotiations, probably had some influence. SO: Would you identify any particular international influence, or was this pretty much a general surge of encouragement? SO: And Thatcher played a part there, too. DS: Yeah exactly…[Namibia] was of considerable importance in the process. Then there were other elements that happened more by luck than by planning. PW Botha’s withdrawal from the scene was perhaps essential before we could move forward, because – he could go to Mount Nebo and he could cross the Jordan River – he just wouldn’t give up that idea of national self-determination, because he belonged to the 1948 generation. And FW de Klerk was prepared to do it within a consociational framework with a good constitution, etc., etc. Now, that was very important. And then, of course, the collapse of the Soviet Union was critically important. It not only meant that the central strategic threat disappeared, but it meant that the SACP was in disarray. The whole idea of a two phase revolution was in shambles. It looked very unlikely that any emerging party would be able to avoid the Washington Consensus. So, a window of opportunity was opened at the beginning of 1990. SO: So, you feel that the end of the Cold War was of critical importance? DS: That was very important, because we felt we could always deal with the ANC – as fellow South Africans – but we were not sure we could deal with the alien influence of the South Africa Communist Party. SO: How aware were you that the Secretary General of the Commonwealth was giving guidance and advice to the ANC? The Secretariat, of course, was providing advice on economic strategic planning, post–transition, to the ANC at this particular time. DS: Again, I think anything that helped the ANC to move away from its original position on nationalisation and central planning to the position they ultimately adopted under Trevor Manuel was really welcome. But I think there were a number of factors involved in that. DS: But, again…Anything that moved in that direction was good. SO: Okay, so you weren’t aware of this, but you would have welcomed it as an adjunct to negotiations. SO: Did you have any qualms or any views on South Africa’s decision to re-join the Commonwealth under Alfred Nzo? I know it was ‘Point Five’ on his list of priorities on becoming Foreign Minister after 1994. DS: No, I think everybody was very happy to come back to the Commonwealth. No problem. SO: Would you say that South Africa has played a particular role in the Commonwealth since? I know that you stayed on as Chief of Staff of de Klerk’s office after 1994. Do you think that South Africa brought a particular moral authority to the Commonwealth? DS: Not really. I think South Africa’s efforts were focussed more on the OAU, at that time – the African Union, later – and the United Nations, etc. SO: From your standpoint now at the de Klerk Foundation, how important would you say is South Africa in the Commonwealth? Or is its focus now primarily towards the BRICS, in South/South relations, in its regional relations? DS: I would say that South Africa’s list of priorities would probably be BRICS, United Nations…No, I think BRICS, African Union, United Nations, Commonwealth. SO: Okay. Down the pecking order, but somewhere there. SO: Dave, thank you very much indeed. Vladimir Shubin (b.1939) is a former Soviet military adviser and academic who played a prominent role in African politics as Secretary of the Soviet Afro-Asian Solidarity Committee and Head of the African Section in the CPSU International Department. Following the unbanning of the African National Congress in South Africa, Shubin acted as the Soviet representative to its National Conference. Since 1992 he has been a Research Fellow and Director at the Institute for African Studies, Russian Academy of Sciences. Princeton Nathan Lyman (b.1935) is an American diplomat who previously served as US Ambassador to Nigeria (1986-89) and South Africa (1992-95). Lyman also acted as Assistant Secretary of State for International Organization Affairs from 1996 to 1998. The ‘Vance-Owen Plan’ may refer to the joint proposals developed by US Secretary of State Cyrus R Vance and British Foreign Secretary David Owen in the late 1970s to secure ‘one man, one vote’ rule in Rhodesia. An alternative ‘Vance-Owen Plan’ would be the peace plans developed by then-UN Special Envoy Vance and EC representative Lord Owen to secure peace between warring factions in Bosnia in the early 1990s. Allister Sparks (b.1933) is a South African writer and journalist who edited the influential Rand Daily Mail during the 1970s, having previously worked for the paper as a columnist in the 1960s. He was also editor of the Sunday Express and acted as correspondent for the Washington Post, The Observer, and NRC Handelsblad. Sparks has written a number of books on South Africa’s transition from apartheid, including Tomorrow is Another Country (1996). He founded the Institute for the Advancement of Journalism in South Africa in 1992. The Cosby Show was an American television sitcom that ran from 1984 until 1992. It starred the comedian Bill Cosby and followed the comedic exploits of the upper middle-class African-American Huxtable family living in Brooklyn, New York. The Abe Bailey Scholarship was established following the death of Sir Abraham ‘Abe’ Bailey, a South African diamond tycoon and politician. The Scholarship comes in the form of a travel bursary and is awarded to university students and young academics (under the age of 25) in South Africa to allow them experience of the United Kingdom. Caltex was founded in 1936 as the California Texas Oil Company, and is currently one of the major international brand names of Chevron Corporation. Operating across some 60 countries in Asia, the Middle East and Southern Africa, it is particularly dominant in the Australian market. In South Africa, Caltex owns a major refinery in Milnerton, Cape Town, and a manufacturing plant in Durban. Caltex was frequently criticised for its South African operations during the apartheid era. Sasol Limited is an energy and chemical company that was formed in Sasolburg, South Africa in 1950. Now operating in 38 countries around the world, its South African operation remains its largest, focusing on mining, gas, synfuels and oil. Its main plant in the province of Mpumalanga is the only commercial coal-to-liquid energy plant in the world. Mossgas (Pty) Limited was an oil and gas company responsible for a controversial fuel-from-gas project near Mossel Bay, Southern Cape. Established in 1989, it was originally planned by the South African government as an alternative energy resource while the apartheid regime was facing international oil sanctions. In 2002, Mossgas merged with Soekor (Pty) Ltd and parts of the Strategic Fuel Fund Association to establish The Petroleum, Oil and Gas Corporation of South Africa (PetroSA). The Sullivan principles are a set of corporate codes of conduct developed by African-American preacher Reverend Leon Sullivan during his time on the board of General Motors in the 1970s. Focused on promoting corporate social responsibility and an end to racial segregation in the workplace, the principles were originally introduced in 1977 to pressure multinational corporations operating in apartheid South Africa. A new, ‘global’ set of Sullivan principles were introduced in 1999 in cooperation with the United Nations. Chester Crocker (b.1941) is an American diplomat who, as President Ronald Reagan’s Assistant Secretary of State for African Affairs (1981-1989), was influential in the negotiations for Namibian independence and in articulating a policy of “constructive engagement” toward apartheid South Africa. Alexis de Tocqueville (1805-1859) was a French political thinker who wrote influential volumes on democracy and revolution in both the French and American contexts. He is considered a representative of classical liberalism and an important precursor to the disciplines of sociology and political science. The Wiehahn Commission was a 1979 inquiry into South African labour legislation, reporting its findings on trade union activity and migrant workers to the state. The Commission recommended that, rather than ban the growing number of unauthorised Black trade unions, the Government should recognise them as legitimate and establish a regulated unitary system of union registration. It should also set up a National Manpower Commission and a special Court to focus on industrial litigations. General Georg Meiring (b.1939) was a South African military figure who served as the first Chief of the South African National Defence Force from 1994 to 1998. He was also the last Chief of the South African Defence Force (SADF) from 1993 to 1994. Derek Auret is a South African civil servant who spent two decades in the Foreign Service from the 1970s to 1990s. He was Special Envoy with the rank of ambassador to the United Nations, Deputy Director-General of Foreign Affairs in the Middle East, and Chief Director for the Americas, Middle and Far East and Australaisa. Auret was also involved in negotiations around the independence of Namibia and Rhodesia/Zimbabwe. He was later chairman of the Western Cape Provincial Public Service Commission. The ‘Mulungushi Minute on the Establishment of a Joint South African-Angolan Monitoring Commission’ was an agreement that emerged from the February 1984 Lusaka Accords, outlining a disengagement process for South African troops in Angola that would stretch for fourteen months following the declaration of a ceasefire. General Johannes Geldenhuys (b.1935) was a South African military figure who served as Chief of the South African Defence Force (SADF) from 1985 to 1990. He is known for his work bringing to an end the South African Border War – or the Angola Bush War – in 1989, after some 23 years of conflict. The South African Defence Force (SADF) was the name of the South African armed forces from 1957 until 1994, to be succeeded in 1994 by the South African National Defence Force. The SADF combined a conventional military strategy of securing the borders of the Republic with a mandate to counter internal threats to the state. During apartheid, this involved quelling violent opposition to minority rule. Major-General Hannes Philipp was an Austrian military figure who served as Force Commander of the United Nations Disengagement Observer Force (UNDOF) from 1974 to 1979. Philipp later acted as Force Commander of the United Nations Transition Assistance Group (UNTAG) in Namibia from 1978 to 1980. United Nations Security Council Resolution 432 was adopted on 27 July 1978 and called for the state of South Africa to relinquish its control of Walvis Bay to Namibia, allowing for the territorial integrity of the nascent independent country. United Nations Security Council Resolution 435 was adopted on 29 September 1978 and set the conditions for a cease-fire and post-conflict elections in South Africa-controlled South-West Africa. The Resolution was influential in facilitating the independence of Namibia, establishing the United Nations Transition Assistance Group (UNTAG). Eschel Mostert Rhoodie (1933-1993) was a South African civil servant who acted as Secretary of the Department of Information between 1972 and 1977. In 1978-79, he was implicated in the ‘Muldergate Scandal’ involving Minister of Information Connie Mulder, which led to the resignation of BJ Vorster as State President. Mulder and Rhoodie had gained support from Vorster for a corrupt ‘propaganda war’ to defend the apartheid government from its critics. Ainsley Gotto (b.1946) is an Australian public figure who was appointed Private Secretary for Prime Minister John Gorton in 1968. Gotto attracted controversy for the influence she reputedly wielded over the Prime Minister. She has subsequently worked in the private sector and served as National President for the Australian chapter of Women Chiefs of Enterprises International. Sir John Grey Gorton (1911-2002) was an Australian politician who served as Prime Minister of Australia from 1968 to 1971. A Senator from Victoria, he had previously served in a range of cabinet positions for the Liberal Party, including Minister for the Navy (1958-63), Minister for the Interior (1963-64), Minister for Works (1963-67) and Minister for Education and Science (1962-68). Otto Krause (1930-1999) was an Afrikaner journalist who founded and ran the news magazine News Check from 1966 to 1971. He was later Editor of the Financial Gazette and a prominent political commentator in the South African media. Johannes Jacobus (Johan) Degenaar (b.1926) is a South African philosopher and Emeritus Professor at Stellenbosch University. From the 1960s Degenaar was active as an outspoken critic of the apartheid ideology in South Africa. Mr Radha Krishna Ramphul was a Mauritian diplomat who served as the Permanent Representative of Mauritius to the United Nations in New York from 1969 to 1982. Jeane Kirkpatrick (1926-2006) was an American diplomat who served as US Ambassador to the United Nations from 1981 to 1985. An ardent anti-Communist, she sat on Ronald Reagan’s National Security Council, Foreign Intelligence Advisory Board and Defense Policy Review Board. Kurt Josef Waldheim (1918-2007) was an Austrian diplomat who served as Secretary-General of the United Nations from 1972 to 1981. He was President of Austria from 1986 to 1992. Trevor Manuel, b.1956, is a South African politician who served as Minister of Finance from 1996 to 2009 and Minister in the Presidency for the National Planning Commission from 2009 to 2014. Edward Gough Whitlam (1916-2014) was the 21st Prime Minister of Australia, serving from 1972 to 1975. Rotary International is an international service organisation that was established in Evanston, Illinois, in 1905. It is a secular organisation that aims to bring together business and professional leaders to support humanitarian services and charity initiatives. Jonas Malheiro Savimbi (1934-2002). Angolan politician and military leader, he founded and led UNITA. UNITA (National Union for the Total Independence of Angola) is an Angolan political party founded in 1966. It thought against the MPLA (Popular Movement for the Liberation of Angola) in the Angolan Civil War (1975-2002), receiving military aid from the United States and South Africa. South African Broadcasting Corporation is a South African radio and television broadcaster, established in 1936. Alfred Nzo (1925-2000). Secretary General of the ANC (1969-1991) and South African Minister of Foreign Affairs (1994-1999). Namibian harbour town. After Namibian independence in 1990, South Africa retained Walvis Bay until 1994. Balthazar Johannes 'John' Vorster (1915-1983). South African politician, served as Prime Minister (1966-1978) and State President (1978-1979). Dr Hendrik Verwoerd (1901 –1966). Prime Minister of South Africa (1958-1966), closely associated with apartheid policies. United Nations Transition Assistance Group. A United Nations force that operated in Namibia from 1989 to 1990. It monitored elections and the transition to independence. Unilateral Declaration of Independence. Rhodesia’s 1965 declaration of independence without British agreement, intended to preserve white minority rule. South African Communist party, founded in 1921. Lord Renwick of Clifton (b. 1937). British diplomat. Head of Chancery, British Embassy, Washington, 1981-84; Assistant Under-Secretary of State, FCO, 1984-87; British Ambassador to South Africa, 1987-91, and to the United States, 1991-95. Author of 'Unconventional Diplomacy in Southern Africa' (Palgrave, 1997). Ronald Reagan (1911-2004). President of USA (1981-1989). Sam Nujoma (b. 1929). Namibian politician and resistance leader. He was leader of SWAPO (1960-2007) and President of Namibia (1990-2005). Connie Mulder (1925-1988). South African politician. Stood against PW Botha for the leadership of the National Party in 1978. FW de Klerk (b. 1936). South African politician and State President (1989-1994). John Diefenbaker (1895-1979). Canadian Prime Minister from 1957 to 1963. The Convention for a Democratic South Africa (CODESA) is the name for a series of multi-party negotiations on the ending of apartheid in South Africa, hosted in 1991 and 1992. CODESA I took place in December 1991, nearly two years after the unbanning of political parties and the release of Nelson Mandela. CODESA II began in May 1992, though negotiations collapsed following the Boipatong massacre in June. The Congress of South African Trade Unions. A South African federation of trade unions, founded in 1985. Roelof Botha (b. 1932).South African politician and Minister for Foreign Affairs (1977-1994). Anthony Barber (1920-2005). British politician, who served in a variety of ministerial positions including as Chancellor of the Exchequer (1970-1974). He also served on the Commonwealth Eminenet Persons Group on South Africa (1985-1986). The war between Britain and Afrikaner settlers fought in southern Africa between 1899 and 1902, culminating in a costly British victory.